My cheeks are beginning to cramp up a bit, because I haven't stopped grinning since the day I discovered this splendid bit of Provincetown nostalgia. 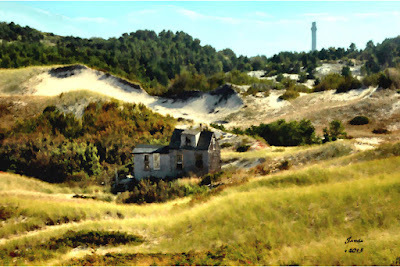 I wish I knew who to credit for this photo, which speaks volumes about the history of the dunes without uttering a single word. I found it on the Provincetown Photography Page on Facebook, posted by a man who had found it online, with no information on its provenance. I was a tour guide on Art's Dune Tours for a few years, and I certainly miss being out there every day, amongst those enormous, sandy hillsides, the wildlife, splendid vegetation, endless vistas of the Atlantic, and most of all, the rambling dune shacks dotting the hills and flats. I would occasionally be asked to drive a shack-dweller into the dunes to spend the week in one of these crude huts, an assignment that I relished. I sometimes got to see inside one shack or another as I helped my passengers carry in things they'd need in a remote little shelter without electricity or even the simplest amenities. distant horizon in this lovely view over the dunes toward Provincetown Harbor. Click to enlarge this photo for a closer look at this venerable shack. Driving these folks back from their respite, I was regaled with tales of glorious sunrises, the smells of beach roses and wildflowers bursting open, and tastes of blueberries and beach plums found on a hike. Stories of wildlife abound, from the scurrying field mice who share most of these primitive shelters, to foraging deer in the forested spots, or gray seals swimming down the beach every night as the sun sizzles into the ocean and twilight takes over. 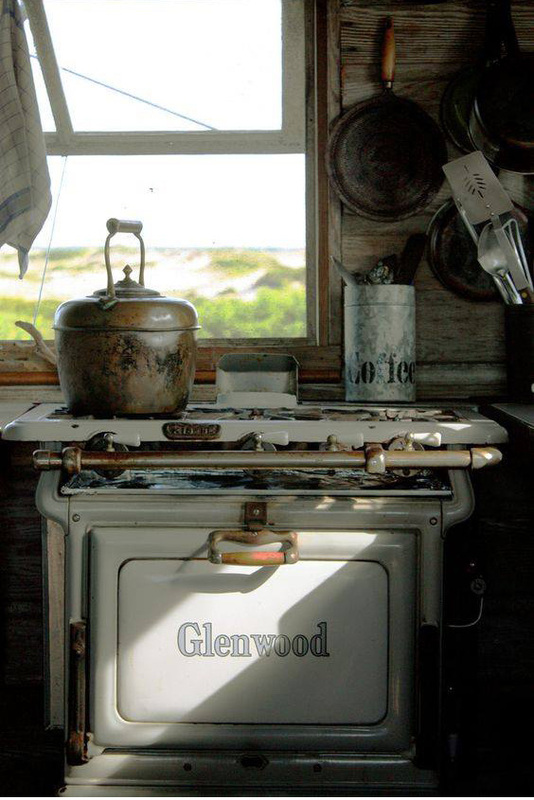 The moment I saw this charming photo I knew I was looking through the window of one of the famous dune shacks where the likes of Tennessee Williams, Eugene O'Neill, Norman Mailer, Lillian Hellman and countless other writers had visited, stayed and worked. In the quiet solitude if the dunes, they were inspired by the sights, smells and sensations of this unique refuge. Nearly every important American writer of the early 1900s sought a bit of solitude in these dunes, and artists flocked there as well. Probably the most universally known artist to have taken inspiration here was abstract painter Jackson Pollock. Click on the dune tour link above to watch a five-minute video showing you a bit of that adventure led by Rob Costa, whose father, Art, started these trips through the dunes in 1939. You can also reserve a tour of the sand dunes for yourself on this site. Click this link Dune Shacks: taste of Cape Cods' floating & well-aged homes for a 27-minute video, hosted by a man with current dwelling rights. He'll take you out walking the dunes and beach, learning some of the history of these remarkable shacks, and looking inside the dwelling that his family has been preserving for the better part of the last century. I highly recommend this video. If you're hardy enough you can walk out into the dunes to spot some of these enchanting shacks yourself. Please try to stay on the trails and avoid trampling the grasses and plant life, and be sure not to disturb folks who might be staying in any one of these primitive shanties. You can also take the dune tour to get out there. It will take you very close to a number of these wonderful shacks.